Lawyer and a PhD researcher, Utrecht University, the Netherlands, funded under the “vidi” grant of Professor M Luchtman by the Dutch Council for Scientific Research (NWO): a.m.karagianni@uu.nl. The first judgement of the General Court (EU) pertaining to the Single Supervision Mechanism (SSM) raised an issue concerning the source of the shared supervisory powers in the system of EU prudential supervision. In the General Court’s view, the SSM Regulation conferred on the European Central Bank (ECB) exclusive powers to carry out specific prudential supervisory tasks vis-à-vis all euro area credit institutions (significant and less significant). At the same time, the ECB’s national counterparts assist the former in implementing its supervisory tasks vis-à-vis less significant credit institutions. We argue that such a scheme requires a clear accountability relationship also between the ECB and the national competent authorities (NCAs), something that is not fully fledged in the current legal framework. Prudential supervision in the EU has drastically changed since the 2014 entry into force of Regulation EU/1024/2013 establishing the Single Supervisory Mechanism (SSM Regulation).1 According to Article 4(1) of the SSM Regulation, the European Central Bank (ECB) assumed the role of the exclusive prudential supervisor over the euro area credit institutions. The ECB did not, however, fully replace national competent authorities (NCAs). NCAs assist the EU authority in discharging its supervisory tasks.2 Indeed, banking supervision has become very much shared between the EU and national level authorities and staff.3 The ECB has taken control over the ‘significant credit institutions’ (SIs), i.e. 120 groups representing approximately 1,200 supervised entities (out of 4,700 in total).4 At the same time, NCAs oversee the ‘less significant credit institutions’ (LSIs). Moreover, concerning the supervision of SIs, the joint supervisory teams (JSTs) – entrusted with the day-to-day supervision of individual banks – are composed of EU and national staff members.5 The system of banking supervision has thus truly become ‘shared’. While (academic) research has given significant attention to the SSM, its operation and its accountability mechanisms,6 little attention has been given to the exact interrelationship between the EU and national levels as regards the division of competencies. Where do which powers lie in this composite system of banking supervision? This is important for determining such issues as the system of accountability and of judicial protection. At what level does accountability need to be ensured? How? To what extent does the ‘sharedness’ of tasks challenge the organisation of controls and the present architecture of the EU in general? Accountability and judicial protection are essential for ensuring the rule of law.7 They promote control over the exercise of public power and prevent arbitrary interferences with the rights and freedoms of private actors. The notion of accountability may come in various forms. Here we focus on political and judicial accountability, i.e., before representative and judicial institutions respectively. Elsewhere, we have labelled the distribution of competences between the ECB and NCAs as hierarchical.8 What skipped general attention so far, seems to be where the supervisory powers come from. At first glance, the question may seem obsolete. The SSM Regulation passed by the Council on the basis of Article 127(6) of the Treaty on the Functioning of the European Union (TFEU) introduces the SSM, outlining the powers of the ECB and of the NCAs. Therefore, the powers have been conferred from the national level(s) to the EU legislature, which subsequently divided the powers between the ECB and the NCAs. However, the issue has appeared to be much more complex, as has been discussed in the first judgement of the General Court pertaining to the operation of the SSM (Case T-122/15 Landeskreditbank Baden-Württemberg v ECB).9 In the Court’s view, the SSM Regulation entrusted all supervisory powers to the ECB (thus not to both the ECB and to the NCAs). That being said, national authorities play an assisting role, acting under the ECB’s command. This postulation, which essentially refers to the source of supervisory powers and as a consequence to the relationship between the ECB and NCAs under the SSM framework, seems to suggest that we are now dealing with a ‘reverse’ delegation doctrine in the EU, i.e., the delegation of EU powers (supervision over LSIs) by an EU institution (the ECB) to the ECB’s counterparts at the national level. We argue that the Court’s articulation carries implications for how such a delegation ought to be organised and accounted for. The current legislative framework of the SSM regulation does not, however, appear fit for purpose. This article proceeds in the following way. First, a brief account of the new system of banking supervision in the EU, its origins and powers (section II) is given. Second, the authors discuss the abovementioned judgment of the General Court, by highlighting the facts, main arguments and main findings of the Court (section III). Third, the article zooms in to the part of the judgement where two scenarios of the source of the supervisory power are outlined and discusses the implications of the Court’s choice for accountability in this respect (section IV). In section V, we conclude. When it comes to questions of hierarchy, the overarching principle in the SSM Regulation is that the ECB is exclusively responsible for the effective and consistent functioning of the SSM.17 For example, NCAs must follow the instructions of the ECB,18 which implies a hierarchy between the EU institution and its national counterparts. 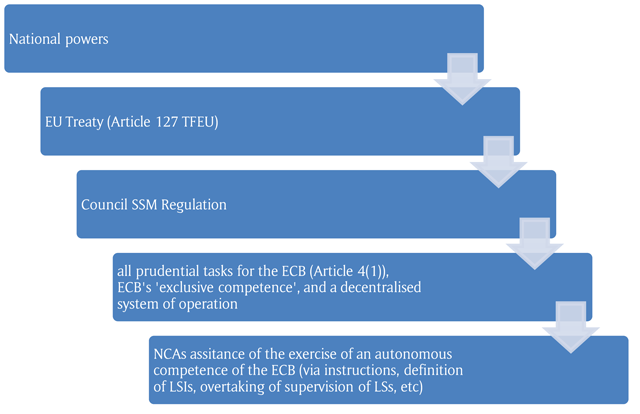 According to Articles 70 and 71 of the SSM Framework Regulation, which lays down the framework for cooperation between the ECB and NCAs,21 if particular circumstances so justify, a credit institution otherwise classifiable as a significant one, may be classified as a LSI, thereby falling under the supervision of the relevant NCA. Particular circumstances exist ‘where there are specific and factual circumstances that make the classification of a supervised entity as significant inappropriate’22 in view of the objectives of the SSM Regulation. However, the term “particular circumstances” is to be interpreted in a strict manner,23 and the assessment thereof made on a case-by-case basis.24 This implies that the ECB generally enjoys discretion in carrying out such an assessment. The inverse case, that of the ECB assuming direct supervision of a LSI, is also possible.25 Article 6(5) (b) elaborates on the circumstances under which the ECB can take over the supervision of an LSI: when this is necessary to ensure consistent application of high supervisory standards. This could be the case where financial assistance has been received from the EFSF or the ESM.26 Indeed, how the ECB is to assess significance became a bone of contention in the Landeskreditbank Baden-Württemberg v ECB (L-Bank case),27 where the General Court also touched upon the functioning of the SSM. Let us start with facts that led to the dispute. In June 2014, the ECB informed L-bank that on the basis of its size and in the light of Article 6(4) SSM Regulation, it had been placed under the direct supervision of the ECB, in other words, it had been classified as a SI. Subsequently, it invited the bank to submit its observations on its identification as a significant institution. In July 2014, L-bank submitted observations arguing inter alia the existence of ‘particular circumstances’ to be classified as a LSI, within the meaning of Articles 70 and 71 of the Framework Regulation. Eventually, the ECB adopted a decision, which confirmed the classification of the L-bank as a SI. In October 2014, L-bank sought review of the ECB decision by the Administrative Board of Review (ABoR), i.e. the ECB’s internal mechanism for review. The ABoR endorsed the ECB decision and as a result, in January 2015, the ECB repealed and replaced its decision dating to 2014, which ultimately meant that the L-bank remained for another year under the direct supervision of the ECB. L-bank contested this last decision before the CJEU, by bringing forward five pleas in law. It is worth mentioning that in arguing that all pleas should be rejected, the ECB was supported by the EU Commission. By its first plea in law,29 L-bank questioned the scope of the competences transferred to the ECB by the SSM Regulation in light of the principles of subsidiarity and proportionality. Specifically, the applicant argued (a) that the ECB interpreted incorrectly the conditions under which a bank’s classification as significant is ‘inappropriate’ under Article 70(1) SSM Regulation; (b) that the ECB was wrong in classifying the bank as significant because it did not take into account the objectives and principles of the SSM Regulation; (c) that the ECB erred in law in its interpretation of the concept of ‘particular circumstances’. After discussing the relevant provisions establishing the ECB’s obligation to state reasons found within the SSM legal framework, Union law and case law,41 the General Court referred to the opinion of the Administrative Board of Review (ABoR). It should be noted that an ABoR opinion is not binding upon the ECB.42 The General Court, however, – considered ABoR’s opinion to be of relevance in this regard, as it – in essence – constitutes an extension of the ECB’s decision. The General Court responded that if an ECB decision endorses the proposal set out in an ABoR opinion, the explanations contained in that opinion may also be taken into account in assessing whether the contested ECB decision contains a sufficient statement of reasons.43 A combined reading of the ECB decision and the ABoR opinion demonstrated that the obligation to state reasons had not been infringed. By its fifth and last plea, L-bank argued that the ECB infringed its obligation to examine and take into consideration all the relevant circumstances of the case, an obligation which is derived from the fundamental right to good administration.47 The ‘relevant circumstances’ that – according to the applicant – were not taken into consideration were (a) that L-bank met no criterion enshrined in Article 6(4) SSM Regulation other than size and (b) previous supervision by German authorities had not displayed any shortcomings. Again, for reasons explained earlier in the judgment, the Court found these arguments to be irrelevant in view of the wording of Article 70(1) SSM Framework Regulation. In the L-Bank case, the applicant questioned ‘that there has been a transfer of competence to the ECB with respect to all of the tasks referred to in Article 4(1) of the Basic Regulation and in respect of all entities’.49 The L-bank distinguished between direct and indirect supervisory tasks, whereby the former were given to the ECB as they related to the supervision of SIs only, while the latter were given to the NCAs as far as they concerned LSIs. This position differed from that of the ECB’s and of the EU Commission’s, who took the view that the ECB is entrusted with carrying out supervisory tasks over all euro area banks, while NCAs were given certain implementation tasks enlisted in Article 4(1)(a) and (c) of the SSM Regulation. However, what these two views have in common is that they both see the SSM Regulation as the source of supervisory powers attributed to the ECB and to NCAs in the new SSM system (Figure 1. Scenario 1). The General Court concluded something else (Figure 2. Scenario 2). In the General Court’s view, the Council – by means of the SSM Regulation – has conferred an exclusive competence to the ECB to carry out specific prudential tasks over all euro area banks. 50 The SSM Regulation does not establish a distribution of competences between the ECB and the NCAs; it ‘simply’ introduces a decentralised framework for the implementation of the ECB’s exclusive tasks. The General Court supported its view by, among other things, the existence of such powers of the ECB as the power to determine ‘particular circumstances’ when the ECB wishes to take over supervision of an LSI. As another example would be the power to issue regulations, guidelines or general instructions to NCAs. The General Court concluded, ‘the existence of such prerogatives is indicative of the subordinate nature of the intervention by the national authorities in the performance of those tasks’.51 All in all, the ECB is in charge and the NCAs assist the ECB under the latter’s command. The difference between the two scenarios is the source from where the NCAs get their SSM-related powers. This influences the relationship between the ECB and NCAs; the organisation of accountability relationships between them (internal accountability), and the accountability system for the SSM operation (external accountability). The General Court, however, favours scenario 2. This Scenario implies that the ECB is the exclusive recipient of all powers contained in the SSM Regulation, with NCAs assisting in carrying these out. Therefore, in the view of the General Court, the SSM Regulation delegates (emphasis added) exclusive competences to the ECB to be implemented in a decentralised system.57 The General Court classifies the relationship between the ECB and the NCAs as ‘hierarchical’, in that the scope of powers of the NCAs, as well as the guidance on how they should carry out those powers, are determined by the ECB. A process of giving and taking back someone else’s tasks and determining the scope or operation of said tasks is a delegation of tasks. However, in light of the traditional direction of the delegation of powers in the EU (from the national to the EU levels), the delegation line between the ECB and NCAs seems to be a ‘reverse’ delegation line. Given the logic of a delegation-accountability line,58 the system of controls requires an accountability line between the ECB (‘delegating authority’) and the NCAs (‘recipients of the delegated powers’). The full presence of that link under the current legal framework is, however, questionable. A clear accountability link between the ECB and the NCAs is essential for the proper exercise of the ECB’s external accountability before the European Parliament (EP) or the Council, and for the correct functioning of the SSM system where the ECB is an exclusive recipient of all the powers. Under the current regime, the ECB is first requested to render account for the operation of a system that it may not be able to control fully without an instrument of directing and punishing individual NCAs.63 Secondly, it can point fingers towards an NCA when rendering account at the EU level, thus shifting the blame for a failure. The fact that NCAs render account for their assistance to the ECB before the national parliaments cannot fully compensate for the weak link between the ECB and the NCA. Here too the possibility to point fingers to the ECB is a possible gap. Finally, given the possibility of potential divergence between EU/ECB and national (political) interests, accountability before the national parliament may not necessarily equate accountability by the ECB in terms ‘for what’, ‘how’ and ‘how heavy’ it exercised its powers. Now, how to remedy the existing situation to match the necessities of scenario 2 and to ensure accountability? The ECB and NCAs should have a strong accountability relationship. 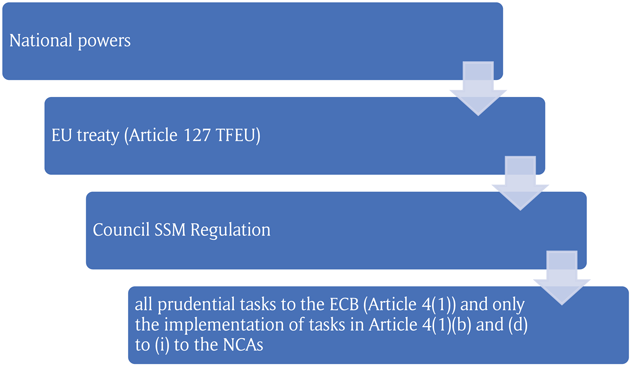 The ECB should particularly be able to delineate the tasks of the NCAs. It should also be able to follow the execution of these tasks; this is already provided for by the legal framework to a certain extent, via the reporting obligations on the part of the NCAs.64 Lastly, the ECB should be able to sanction them for poor performance. This is currently lacking, but in this way, the ECB will be able to render account for the operation of SSM before the EP and the Council. First, it would be helpful to determine the legal form of ECB instructions, because this predetermines the necessity and possibility to use one or more accountability channels. Will it become available to the public/private actors mentioned in that instruction? This would facilitate judicial accountability, as the private parties would arguably be able to challenge it before a court. Will the instruction affect a large number of credit institutions or will it be addressed to an individual bank? 65 The answer to this question determines whether an affected bank would have standing before a court. Does the NCA to which an instruction is addressed enjoy discretion in executing it? The answer to this question determines which court, EU or national, will be competent to review the instruction ex ante. In addition, the adoption of such instructions may require the establishment of necessary (administrative) procedures within the ECB. If instructions are used only between the ECB and NCAs, the political accountability of the ECB for such instructions before the EP and the Council (and perhaps even before the relevant national parliament) should be enhanced. Currently, the legislative framework is not explicit on these issues, which may lead to accountability gaps. In any case, a final option is that of legal accountability. One could think of using the possibility contained in Article 271(d) TFEU, which resembles the infringement procedure of the EU Commission against Member States (Art. 258–260 TFEU), the difference being that by virtue of Article 271(d), the ECB can bring an NCA before the CJEU. More importantly, the taking over of supervision of an LSI may be seen as a sanction against an NCA/MS. However, it is worth considering that this also affects the private actor and the operational ability of the ECB to supervise all credit institutions in the first place. According to the General Court, the SSM Regulation entrusted the ECB with exclusive powers of prudential supervision over the euro area credit institutions. The NCAs assist the ECB in discharging its tasks. The General Court has classified this relationship as ‘hierarchical’. We have argued that the relationship between the ECB and the NCAs involves a ‘reverse’ delegation line; such a link requires an accountability relationship between the ECB and the NCAs, which is not fully-fledged at this moment. The legal form of the instructions needs to be clarified, as it carries implications for the types of accountability that could be available for different actors (private parties, political forums). In addition, the ECB needs to have a rectification mechanism against NCAs which do not follow its instructions. At this moment, it lacks a tool to sanction an NCA for poor performance or non-compliance and the accountability of an NCA before its national parliament may not necessarily compensate for the ‘weak’ link between the ECB and the NCA. This discussion also raises a more general concern about the suitability of the EU’s ‘constitutional’ architecture to the realities in which it operates. The SSM framework is only one example of a rapidly developing ‘mixed/shared/integrated administration’ of rule-making, supervision and enforcement. The trend increasingly merges the functions of, roughly speaking, two separated legal orders – that of the EU and that of EU Member States. This has been developing without necessarily being accompanied by modifications to the Treaties.70 Importantly, the merging of tasks occurs whilst the system of controls between two legal orders remains separated. This creates incomplete or weak accountability systems and should deserve our attention in research and practice. 1Council Regulation (EU) 1024/2013 conferring specific tasks on the European Central Bank concerning policies relating to the prudential supervision of credit institutions (SSM Regulation)  OJ L 287. 3Ton Duijkersloot, Argyro Karagianni and Robert Kraaijeveld, ‘Political and Judicial Accountability in the EU Shared System of Banking Supervision and Enforcement’, in Miroslava. Scholten and Michiel Luchtman (eds), Law Enforcement by EU Authorities. Implications for Political and Judicial Accountability (Edward Elgar 2017). 4For a list of significant supervised entities see: European Central Bank, ‘List of Supervised Entities’ <https://www.bankingsupervision.europa.eu/ecb/pub/pdf/list_of_supervised_entities_201709.en.pdf?aaff7233233ab4ae58a1b4acfc3a7b5a> accessed 23 July 2018. 5Regulation (EU) 468/2014 of the European Central Bank of 16 April 2014 establishing the framework for cooperation within the Single Supervisory Mechanism between the European Central Bank and national competent authorities and with national designated authorities (SSM Framework Regulation)  OJ L 141, art 4. 6Duijkersloot, Karagianni and Kraaijeveld (n 3); Laura Wissink, Ton Duijkersloot, Rob Widdershoven, ‘Shifts in Competences Between Member States and the EU in the New Supervisory System for Credit Institutions and Their Consequences for Judicial Protection’ (2014) 10 Utrecht Law Review 92; Gijsbert Ter Kuile, Laura Wissink, Willem Bovenschen, ‘Tailor-made Accountability Within the Single Supervisory Mechanism’ (2015) 52 Common Market Law Review 155; European Court of Auditors, ‘Special Report No 29/2016: Single Supervisory Mechanism – Good Start But Further Improvements Needed’ <https://www.eca.europa.eu/en/Pages/DocItem.aspx?did=39744> accessed 17 November 2017; Christos Gortsos, The Single Supervisory Mechanism (SSM): Legal Aspects of the First Pillar of the European Banking Union (1st edn, Nomiki Bibliothiki 2015); Andreas Witte, ‘Standing and Judicial Review in the New EU Financial Markets Architecture’ (2015) 1 Journal of Financial Regulation 226. 7Rob Widdershoven and Paul Craig, ‘Pertinent Issues of Judicial Accountability in EU Shared Enforcement’ in Miroslava Scholten and Michiel Luchtman (eds), Law Enforcement by EU Authorities. Implications for Political and Judicial Accountability (Edward Elgar 2017). 8Duijkersloot, Karagianni and Kraaijeveld (n 2); Miroslava Scholten, ‘Mind the Trend! Enforcement of EU Law Has Been Moving to ‘Brussels’ (2017) 24 Journal of European Public Policy 1348; Miroslava Scholten, Martino Magetti and Esther Versluis, ‘Political and Judicial Accountability in Shared Enforcement in the EU’, in Miroslava Scholten and Michiel Luchtman (eds), Law Enforcement by EU Authorities. Implications for Political and Judicial Accountability (1st edn, Edward Elgar 2017). 9Case T-122/15 – Landeskreditbank Baden-Württemberg v ECB  ECLI:EU:T:2017:337. Currently under appeal, Case C-450/17 P – Landeskreditbank Baden-Württemberg. 10European Commission, High Level Expert Group on EU financial supervision to hold first meeting on 12 November <http://europa.eu/rapid/press-release_IP-08-1679_en.htm> accessed 23 July 2018. 11Jacques de Larosière, Leszek Balcerowitz, Otmar Issing, Rainer Masera, Callum Mc Carthy, Lars Nyberg, José Pérez, Onno Ruding, ‘The High -Level Group on Financial Supervision in the EU- de Larosiere Report’ (Brussels 2009) (‘de Larosière report’). 14See: Benedikt Wolfers and Thomas Voland, ‘Level the Playing Field: The New Supervision of Credit Institutions By the European Central Bank’ (2014) 51 Common Market Law Review 1463. 15See inter alia: Merijn Chamon, ‘EU Agencies Between Meroni and Romano or the Devil and the Deep Blue Sea’ (2011) 48 Common Market Law Review 1055; Miroslava Scholten and Marloes van Rijsbergen, ‘The ESMA-Short Selling Case: Erecting a New Delegation Doctrine in the EU upon the Meroni-Romano Remnants’ (2014) 41 Legal Issues of Economic Integration 389. 16Thomas Huertas, ‘Banking Union: the Way Forward’ in Juan Castañeda and David Mayes and Geoffrey Wood (eds), European Banking Union – Prospects and Challenges (Routledge 2016). 17SSM Regulation (n 1) art 6(1). 19SSM Regulation (n 1) arts 6(4), 6(5) and 6(6); SSM Framework Regulation (n 5) ch 1 and 2. 20SSM Regulation (n 1) art 6(4). 21SSM Framework Regulation (n 5) art 1. 25SSM Regulation (n 1) art 6(5)(b). 27Case T-122/15 – Landeskreditbank Baden-Württemberg v ECB  ECLI:EU:T:2017:337 (L-Bank v ECB). 28SSM Framework Regulation (n 5) art 33(1). 30See tasks, SSM Regulation (n 1) art 4(1). 42Decision of the ECB concerning the establishment of an Administrative Board of Review and its Operating Rules , OJ L 175, art 13(5). 43L-Bank v ECB (n 27) para 127. 47Charter of Fundamental Rights of the European Union, (CFR)  OJ C 326, art 41. 48Miroslava Scholten and Michiel Luchtman (eds), Law Enforcement by EU Authorities. Implications for Political and Judicial Accountability (Edward Elgar 2017). 49L-Bank v ECB (n 27) para 50. 51ibid. para 59, italics added. 52SSM Regulation (n 1) art 20(1). 55See inter alia Ter Kuile, Wissink, Bovenschen (n 6); Duijkersloot, Karagianni, Kraaijeveld (n 3). 56SSM Regulation (n 1) art 21. 57L-Bank v ECB (n 27) para 54. 58Kaare Strøm, ‘Delegation and Accountability in Parliamentary Democracies’ (2000) 37 European Journal of Political Research 261. 59Mark Bovens, ‘Analysing and Assessing Accountability: A Conceptual Framework’ (2007) 13 European Law Journal 447. 60Miroslava Scholten, ‘Independent, Hence Unaccountable’? – The Need for a Broader Debate on Accountability of the Executive’ (2011) 4 Review of European Administrative Law 5. 61Protocol (No 4) on the Statute of the European System of Central Banks and of the ECB (ECB Statute)  OJ C 202. 62Duijkersloot, Karagianni, Kraaijeveld (n 3). 63See also para 60 of the judgement. 64SSM Framework Regulation (n 5) art 21. 67Miroslava Scholten, The Political Accountability of EU and US Independent Regulatory Agencies (1st edn, Brill 2014). 69Alissa M. Dolan, Elaine Halchin, Todd Garvey, Walter J. Oleszek and Wendy Ginsberg, ‘CRS report for Congress ‘Congressional Oversight Manual’ (Congressional Research Service 2014) <https://fas.org/sgp/crs/misc/RL30240.pdf> accessed 19 August 2018. The authors gratefully acknowledge the financial support of the NWO in writing this article via the “veni” grant. Both authors are grateful to the anonymous reviewers whose comments benefited an earlier draft.